I am looking at buying my first investment 1 bed condo and wondering if you see any benefit in waiting till the 3rd Bayview Place pre-sales open as opposed to doing a pre-sale at Legato now? Don't rush in. The market is near the top if not already at peak. Interest rates will most likely rise before the mortgage is ready to be renewed. Factor in strata fees, taxes and contingencies as real costs. A TFSA invested in blue-chip dividend stocks will churn out 5% hassle-free, more with no tax plus share price appreciation. You could see 10%+ return without dealing with strata councils or pesky renters. No TFSA? Dividend shares can still churn out 5% as income with favourable treatment from the tax man. Edited by johnk, 14 July 2015 - 02:16 PM. Well this is easy to agree with. The market is near the top if not already at peak. This is misleading. It makes it sound like prices have been rising for a long time and are peaking. In fact the opposite is the case. Prices have been about flat for a long time and the market is improving. Interest rates will most likely rise before the mortgage is ready to be renewed. Factor in strata fees, taxes and contingencies as real costs. Definitely factor in all the other costs. And make sure you can pay the mortgage at about 6% if you had to. A TFSA invested in blue-chip dividend stocks will churn out 5% hassle-free, more with no tax plus share price appreciation.... Dividend shares can still churn out 5% as income with favourable treatment from the tax man. Very misleading. Average dividend yield is nowhere near 5% these days. Sure you can find individual companies with a 5% yield but that is the outlier. You could see 10%+ return without dealing with strata councils or pesky renters. You certainly could. 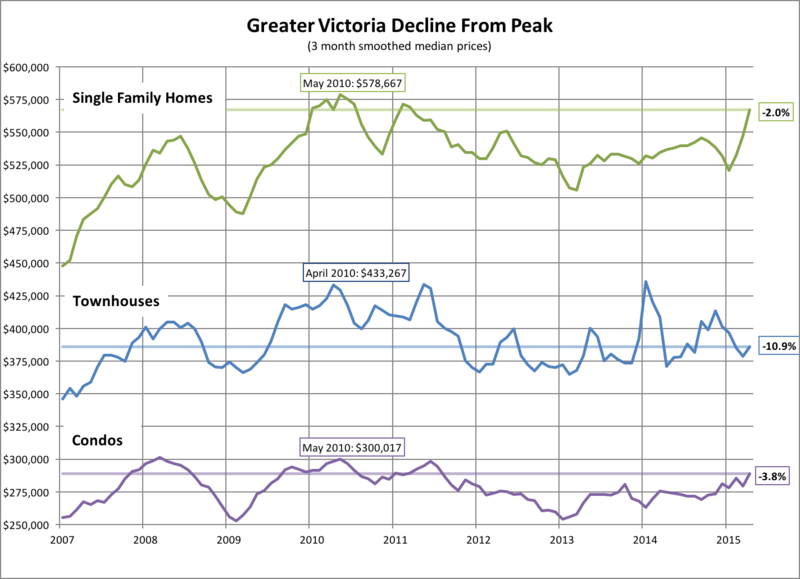 But if you're mentioned that real estate is expensive in Victoria, why not mention that stocks are expensive right now? By some measures like the Shiller P/E, the market is quite expensive right now compared to historical norms. Not saying you can't expect a decent return from the stock market going forward, but be fair in your analysis. As for whether a pre-sale condo is a good investment... If you're renting it out I would go with the small cheaper units. Better return on rent there than the high end ones. Edited by pherthyl, 14 July 2015 - 02:54 PM. There are solid companies out there paying 5% or close to it and with share price appreciation 10% is very achievable. Even if the companies are outliers that doesn't mean they are not there. There are also REITs and ETFs throwing off solid returns. Point is, they are all far more liquid than real estate and that's important if you need to cash out quickly. My opinion is the condo market is close to the top if not already over-priced at $500+/sq. ft. But that's my opinion and I would not invest on that basis, not saying don't do it just that its not for me. There are easier, less stressful ways to make money. Real estate does not always rise in value, condos in particular. Perfect, I will hold off making a decision until I get your feedback. Thanks so much. Marko I know you put a lot of effort into this (investment condos) for yourself and of course you have the inside info. I wonder if there's a market there, to basically provide market insight on real estate investment, divorced from the real estate practice itself? In other words, to act as an unbiased advisor similar to a fee-based financial advisor. I think this is really lacking in real estate, as the traditional experts (realtors, mortgage brokers, bankers, etc) all have a conflict of interest. ^ You'd think property managers would take this on. That would be similar to your comparison of a financial manager (fee based). Good point. Does anyone know whether any property managers provide this service? I don't think there is enough liquidity in the lower priced investment condo market for it to be a business. The line between good and bad is so fine I can't see it as viable. If the goal was just to show people the difference between ok and straight up gambling on prices, that might be another thing. I suppose it would all depend on how much cash you've got for a down payment. If you have $200,000 burning a hole in your pocket would you be better served putting it on the market, locking it in to a GIC, or buying a rental condo? I'd say the latter is the most secure of the three. Disclosure: I own three investment units: 834 Johnson - The 834; 83 Saghalie - Promontory; 728 Yates - Era. I've served as a strata council member at The 834 (past) and Era (current). I do not work for a developer; however, my personal intent is to buy one or two units at the upcoming Bayview Place 3 depending on launch pricing. I also have maxed out RRSPs and TSFA soon to be maxed later this year. Beyond that I have no investments in non-registered accounts that are not real estate. I also have a rental property management licence so I may be better skilled in terms of renting my units out compared to the average person. In terms of investment condos the key is to stay super small. Citified will shortly be publishing an article I wrote on investment condos (Mike where are we at with that?) in which I lay out and explain five different reasons to buy smaller/lower floor/cheaper, but in high-quality concrete buildings within walking distance of downtown. 1. The purchase price to rent ratio advantage, or return on investment. 2. The property transfer tax (PTT) advantage. 4. The municipal property tax and strata fee expense to gross rent ratio. 5. Liquidity and cash flow advantage. In terms of Bayview vs downtown I'll give you my personal experience as I just had to rent out both my Promontory and Era units simultaneously. Promontory: 440 sq/ft, parking spot, no balcony, facing north with limited views, I paid approximately give or take $195,000 for it in 2011 during pre-sales. I put it up for $1,150 + utilities and had 5 or 6 rental applications. I rented it to a doctor for a year. Strata fees approx $150/month, insurance $240/year, taxes $125/month. Era: 507 sq/ft, no parking spot, nice balcony, north facing with no views, I paid approximately $215,000 for it in 2014 during pre-sales (when Era dropped their one bedroom pricing on re-launch). I put it up for $1,195 + utilities and had 11 rental applications. I rented it to another doctor here for two years. Strata fees approx. $200/month and insurance/taxes same as Promontory. I felt that at the Promontory I was fairly close to market value or maybe $25 below. The Era I think I went in $75 to $100 below market value but I wanted an ideal tenant. I have a busy business schedule, ideal tenant is more important than absolute return. The biggest difference is at Bayview I didn't have to answer a million and one emails about "where am I going to park my car?". At Bayview the footprint is so big that they can provide all buildings with at least one parking spot per unit; which cannot be done downtown at many sites. My decision to go with Bayview Place #3 isn't so much return on rent but it is a bit less hassle having a parking spot with a unit and I think the area has latent potential (third building will make it a very attractive hilltop, new bridge, potential roundhouse and dockside green movement). I think I can get good return on rent plus appreciation (depending on launch price). Condos don't make a great investment on paper compared to an old triplex in Fernwood, for example, but for me it is beyond the numbers on paper. I just don't have time to deal with broken toilets and other ongoing maintenance issues associated with an 80-100 year old triplex. In terms of TSFA/RRSPS vs Condos....I have both. The great thing about condos is leverage. In the next 12 months I'll generate positive cash flow from all three condos and the principal will drop a combined $15,000....will I make that much in the markets? Probably not. Feel free to ask me more specific questions. Edited by MarkoJ, 15 July 2015 - 08:38 PM. I agree with you that this type of service is lacking, but there isn't enough of a market in terms of real estate investing. I think there is a really solid market for this in terms of mortgage advice. You have the sophisticated investor that does not need help and than you have the mom and pop investor that buys one, two, or three condos and is heavily influenced by emotion. I see it ALL the time. "Well Bob, based on my per sq/ft calculations, layout, potential rent, concrete build, not being next to an elevator shaft or staircase I think you should buy unit #305." "Okay Marko, let's go with #1107 it has inner harbour views,"
How would a property manager be more qualified for this than a REALTOR®? I would say depositing three cheques every month is a little less stressful than the volatility in the markets. What would make real estate investment condos very stressful is a piss poor rental market (not the trend) and a huge increase in interest rates (not the trend). Condos are the same price give or take they were in 2007. We are almost pushing a decade at "close to the top." Thank you so much for taking the time to respond in such an in depth way, exactly what I was looking for. It will take me some time to process all the great info. I have been on both sides with lots of rental properties and lots of investments. In the past few years I have sold off most of my rental properties in Victoria as quite frankly I can't justify the rate of return against the market value of the property. In my opinion it is a mistake to calculate return against what you paid for the property, you need to calculate return against what the property is worth today. I got to the point where most of my rentals were yielding 3% or less against market value and that was valuing my time managing tenants and the properties at $0. I could be wrong but I think that you would be hard pressed to find any decent property were you could yield anywhere close to 5% with all costs factored in. There are lots of decent investments that yield 4.5%+ and many of them have DRIP programs which you can use to pick up an additional 2%-3% if you don't need the income right away. I still have lots of rental properties, just not in Victoria where the combination of rent controls, increased taxes, sewage fees and low proportional rents make it unviable in my opinion. We are talking about buying pre-sales right now and are comparing recent examples versus current rent. There has not been a big increase in market value. It's not like my $215,000 Era condo is worth $300,000. Realistically market value is $225,000 - $235,000 and transaction costs would mean I am breaking even if I wanted to sell it. I've owned many CND dividend paying plays for years (BMO, TRP, RCI, etc.). If I buy a $200,000 condo and take out a $160,000 mortgage and $40,000 down and I can generate positive cash flow ranging from $100 to $300 per month plus principal pay down. Let's ignore appreciation. Alternative is I buy $40,000 worth of shares of something. Dividends can match the positive cash flow but not sure if I would be so confident that the share appreciation would be higher than the principal pay down on the condo. If the condo happen to appreciate then it is a no brainer, but never count on that happening. It is a nice bonus. In my opinion the debate of registered investment vs real estate has merit in terms of a good debate. Non-registered account vs real estate I am leaning towards real estate at this moment (mortgages are incredibly cheap, rental market is super strong). With about 1,000 units of rentals coming to downtown Victoria alone over the next 1-4 years, how will this impact the condo rental market? Have you noticed any decline in interest or a watering down of good renters since the half dozen downtown rental projects that have completed over the last two years? I'm sure there have been about 400 units or so since 2013. And yes, the article. I'll jump on that!